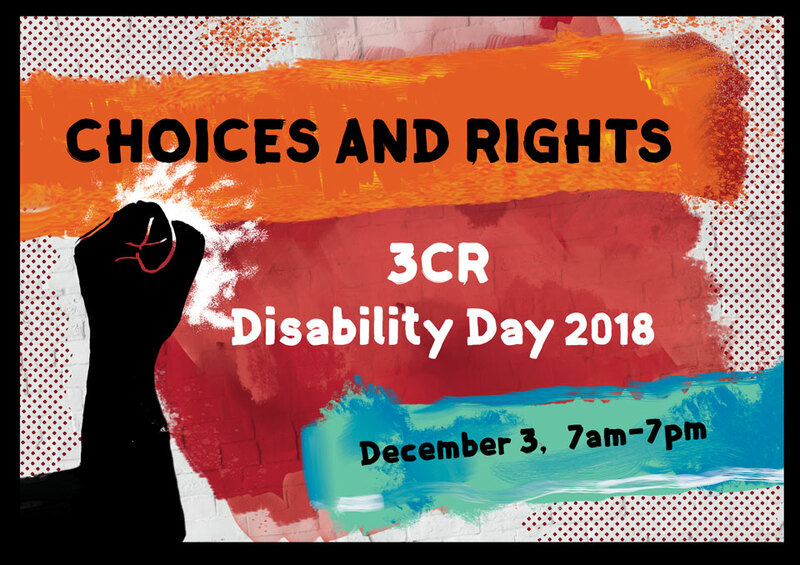 International Day of People with a Disability is coming up on Monday 3 December and we have an exciting lineup of advocates, artists and radical disabled activists for 3CR's dedicated 12-hour broadcast. We will be featuring live performances from singer/songwriter Heidi Everett and the amazingly talented cast of Not Normal from the Melbourne Fringe Festival. You will also hear some familiar voices with special episodes of Chronically Chilled, Billabong Beats, Doin' Time, Raising Our Voices and Brainwaves from our regular 3CR programmers. Tune in from 7am-7pm on Monday 3 December to help us fight for the choices and rights of disabled people. Breakfast with Phineas Meere (The Boldness) and Larrissa MacFarlane, chatting on the the meaning on International Day of People with a Disability, the flaws in our social security systems and the prevention of violence against disabled people, with special guests Naomi Chainey and Nicole Lee. Nicole Smith turns to Jax Jacki Brown and Elvira Alic for agony-aunt-style advice on becoming a parent with disability. Disability activists all around the world took direct action in 2018 to demand social justice and equality for people with disability everywhere. Helen Gwilliam reviews just some of the protests by disability activists in the past year, including activists occupying parliaments in the UK, Poland and Nigeria and the march of empty wheelchairs in Argentina. Volunteers from AMIDA (Action for More Independance and Dignity in Accomodation) discuss disability and the culturally and linguistically diverse perspective with Lisa from Brain Injury Matters (BIM) and Viviana from Action on Disability within Ethnic Communities (ADEC). Raphael Kaleb (The Boldness) talks with Eva Sifis, founder of By Accident, and Angus Thompson, star of The Angus Project, premiering December 4 on ABC. Jessielea Skillicorn, AKA The Inclusionist, talks to Julie Phillips, Tim Chan, Bryce Pace and Danny Dickson about inclusive education. The Billabong Beats structure is modeled on an aboriginal camp with a water-hole segment & a fire segment, giving a voice to both Kulin & Western Kulin peoples, hosted by Gavin Moore, a 47 year old Wemba Wemba man from the Southern Riverina area. Our guest for international day of people with a disability is Lisa Zamitt from Connecting Home - a service for the Stolen Generations, here to tell us about the NDIS and how they deliver it to their indigenous clients. Pat Williams deconstructs mental healthcare approaches with special guests Shelley Alexander and Heidi Everett, with a live studio musical performance by Heidi. Chronically Chilled is a show that discusses experiences and topics related to chronic illness, disability and mental health. In this special Disability Day episode, Marijo Pozega speaks with Ricky Buchanan. Ricky is an independent disability activist, assistive technology innovator and artist who is passionate about disability and chronic illness and has recently written a report, titled: ‘Just Invisible - Medical Access Issues for Homebound/Bedridden Persons'. Naomi Chainey chats to the cast of the Fringe Festival's Not Normal. Tune in for some live spoken word and musical performances from Claire Barnier, Sonia Marcon and Gem Mahadeo. Celebrating the identity of Autistic people on the LGBTQIA spectrum, and discussing access to healthcare with Ruby Mountford, Ashley Waite and Mellum Rose. 3.30pm - Brainwaves - NDIS: Does it Discriminate Against Mental Illness? Brainwaves is a weekly 3CR program produced and presented by people with a lived experience of mental illness, sponsored by Wellways Australia. Brainwaves aims to increase awareness of mental health in the community, reduce the stigma associated with mental illness and provide an avenue for exploring mental illness and recovery. For International Day of People with a disability we are discussing access to the NDIS. In this hour, meet some of the first wave of disability activists. This is the first in a series exploring the ground covered from the 60's on protests, legislation and establishment of organisations led by people with disability. Is the development of our disability pride and identity at risk by placing all the focus on mainstreaming people with disability in society? Cate Dunn (Youth Advocate), Caroline Bowditch (Executive Director, Arts Access Victoria), John Baxter, and Jason McCurry (Sports Officer, RMIT University) battle it out to answer this question at the DARU Strengthening Disability Advocacy Conference 2018. Proudly supported by the City of Yarra.